Many of the activities put on by the Ladies Guild also double as fund-raisers which greatly benefit the parish in many ways. 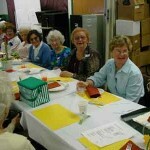 The Ladies Guild meets on the fourth Monday of every month, at 11:00 a.m. in the Meeting Room. All the women of the parish are welcome to come to the meetings. For more information, please call the rectory at 294-8953. 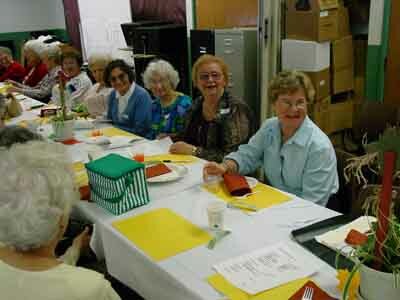 The Ladies Guild was started in 1952 as the “Fatima League” in honor of Our Lady of Fatima. Approximately seventeen ladies of the parish and Fr. Matthew Caroian formed the club, and a few of the charter members are still active. In the mid-1970’s, the name of the club was changed to “St. Martin of Tours Ladies Guild Under the Patronage of Our Lady of Fatima”. (The statue of St. Martin of Tours outside the church was donated by the Fatima Guild. ) When the church was renovated in the mid-1980’s, the Ladies Guild donated the huge stained glass window of St. Martin of Tours Church, which had previously been a plain glass window. There has been an annual luncheon and Fashion Show fundraiser almost every year since 1953. Other fundraisers have included cake sales, boutiques and support of other activities in the parish. The aims of the organization are spiritual, service and social. All women of the parish are welcome to join us.